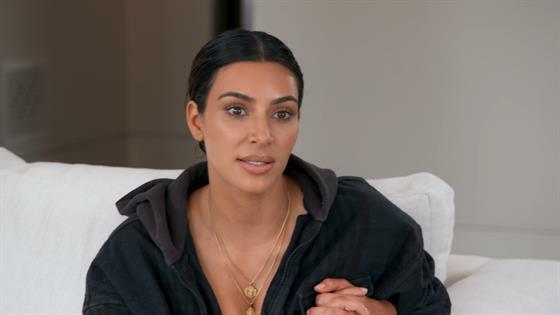 Kim Kardashian Wants to "Change the World For the Better"
Kim Kardashian wants to educate her children on the realities of gun violence. In this clip from Sunday's all-new Keeping Up With the Kardashians, Kim reveals to sister Kourtney Kardashian and friend Larsa Pippen that she and Kanye West are going to take their eldest daughter North West to the March for Our Lives rally. "Kanye told me he was taking North to school today and he was explaining to her that we're gonna go to this march for gun violence in Washington D.C. and we're gonna take her and how like he grew up and how dangerous the neighborhood was in Chicago," Kim tells them. As a couple, they not only thought it would be the right lesson to teach their child, but a way to support a cause close to their hearts. "Kanye is from Chicago and he always talks about the gun violence and with everything that's going on in the world, we just wanted to do something and be a part of something we both really believe in," the mother of three explains to the camera. "If we just speak up and get things done, I think we can change the world for the better." Kim is hoping this moment will be one her daughter never forgets. "Hopefully it'll be meaningful to her," Kim adds. See Kim explain why taking North to the March for Our lives rally is so important in the clip above.